Blue lights, green lights, and red lights rose out of the dusky fog. Men emerged carrying bright Japanese lanterns; women held dim electric bulbs. As summer waned in Boston during the last days of August in 1899, a new regulation came into effect. 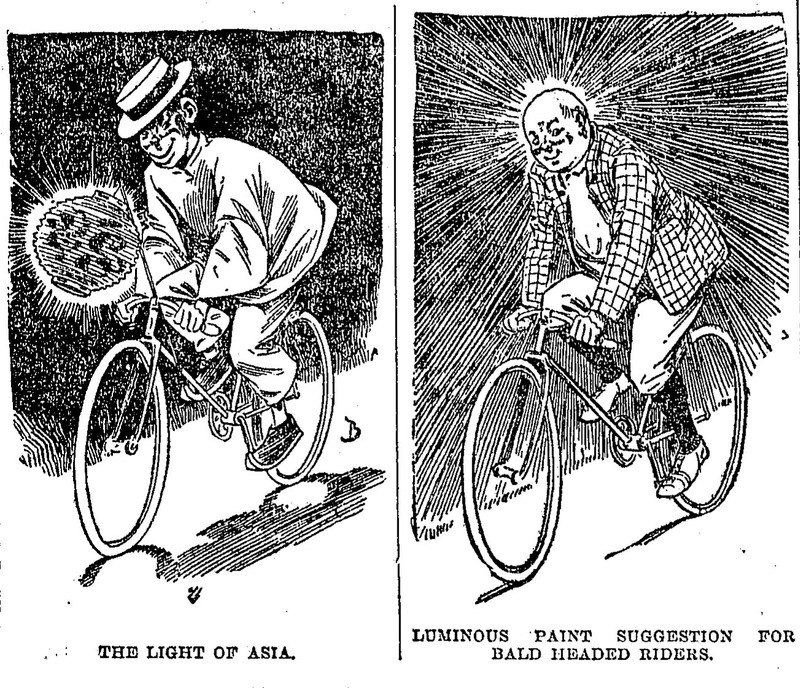 Starting on the night of August 21, 1899, bicyclists in Boston were to carry lights as they rode. No longer would the 19th century darkness of Boston’s streets, paths, and byways yield unseen horrors like speeding bicyclists. The only issue was that no one had thought to define exactly what kind of light the law should require for bicycles, or how many would do, or even where or how they should be mounted. And this seemed perfectly daft to a populace accustomed to a world of darkness after twilight faded into night. The patrolmen charged with enforcing the new law suffered for that vagueness; some suffered the abuse more amiably than others. On the night of the 21st in that enlightened August of 1899, patrolmen were made aware that the regulation had gone into effect, but were asked not to enforce it until the following night. Instead, for the night of the 21st, they were to ‘remind’ bicycle riders of their new responsibility. Franklin Park, Boston (Photo credit: Wikipedia). In 1912, the Franklin Park Zoo would be founded, thirteen years after the passage of the bicycle lighting law. Patrolman Cramm, whose beat included the part of Franklin Park known as the ‘roof garden’, saw one bicyclist who had attached a big reflector lantern to a pole extending from the front of his bicycle, much like what he had seen hanging in a “country doctor’s doorway”. Andy called after the bicyclist as he pedaled off into the darkness, amid the cheers of the spectators and pedestrians who had assembled to watch the unexpected fun brought on by the new regulation. 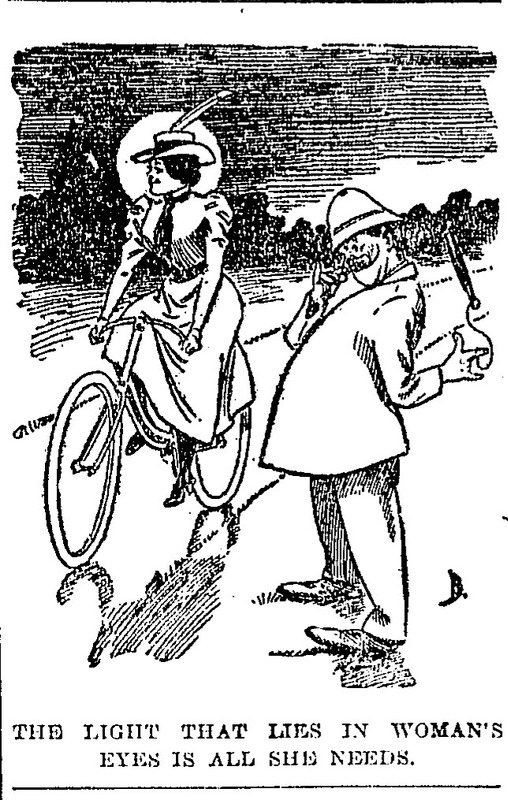 Many of the bicyclists taunted Cramm and other patrolmen with their varying interpretations of the new vaguely-worded regulation that only required that they carry a light. Some came carrying Japanese lanterns. Others carried bullseye lanterns. Still others, like the bicyclist above, carried a huge reflector. A few carried small, dim electric lights that were barely visible. The lights spanned all of the available colors. And then there were the bicyclists who hadn’t even heard of the new law, and who had come as they always had, in the dark, without any lights whatsoever. And it fell to Andy Cramm and two other policemen to inform all of the bicyclists in the nearly 600-acre Franklin Park of the new regulation and to evaluate their sometimes half-serious attempts to comply with it. Cramm, who was stationed near the Blue Hill Avenue entrance that night, was said to have suffered the worst of the abuse. Known for his jovial, approachable manner, he handled the pranksters with ‘kid gloves’, but promised to bring his ‘boxing gloves’ the next night after the regulation really went into effect. As Andy Cramm stood in the middle of the path leading from Blue Hill Avenue, prankster bicyclists rode past him, taunting the new law, their bicycles bedecked with red, green, and blue lights, of every variety. Efforts had clearly been made to be the bicyclist with the most ridiculous light set-up. Some bicyclists carried the lights in their hands; some attached them to the rear of their bicycles. Others affixed them to long poles and attached these to the fronts of their bikes. One young couple, riding a tandem bicycle, hadn’t heard of the coming regulation and drove without a light, wheeling around Patrolman Andy Cramm as he kindly, but firmly berated them. They eventually wheeled off into the darkness as the man called back: “Ta-ta Andy, I’ll see you in church.” Another man, attempting to make a good faith attempt to comply with the law, showed up at Franklin Park with a well-lit corncob pipe in his mouth. A light? Surely. But, Patrolman Andy Cramm still told him the error of his ways. Cramm and his two fellow patrolman eventually found the very darkest section of Franklin Park – at ‘Lovers’ Lane’, where they found many bicycles lacking lights – and riders. None of the riders, had they even been found, were arrested, the patrolmen said. To do so would leave their beats unprotected for too long, they reasoned. An arrest cost the patrolmen about an hour, the time it took to bring the perpetrators to the police station and then to return to the park. Hey Ryan, what a neat post. People sure haven’t changed much, have they? Hi Karen! Welcome back to the blogosphere!